Nature, 2018, 557(7704):247-251. SB431542 purchased from Selleck. MDA-MB-231 cells were treated with 5 ng ml−1 TGF-β or 5 μm ml−1 SB431542 for 12 h, and then collected for western blotting using the indicated antibodies (c) and quantification of Lats2 (normalized to actin) and p-Yap (normalized to Yap) protein levels. Nat Commun, 2016, 7:11123. SB431542 purchased from Selleck. Long-term response of SB431542 and SB203580 release from scaffold implants. Histological results of H&E staining showing the capsule thickness of the various treatments at 14 days. The scale bar shows 100 uM and is applicable to all images in the panel. In each bar graph the tissue and cellular response to SB431542 were found to be significant from the control. For each treatment group six animals were tested. Statistics are performed by ANOVA with Bonferroni comparisons and taken to be significant at ∗∗P < 0.01. Acta Biomater 2014 10(7):3108-16. SB431542 purchased from Selleck. Hedgehog, Igf and Tgf signaling are required for myocardial regeneration in zebrafish. (C) Quantification of the effects of CyA (10 uM), NVP AEW541 (2 uM) and SB-431542 (10 uM) on cardiomyocyte proliferation after resection injury. Fish were treated from 6 to 7 dpa. (D) Quantification of the effects of CyA, NVP AEW541 and SB-431542 on proliferation after genetic cardiomyocyte ablation. Development 2013 140, 660-666. SB431542 purchased from Selleck. Transforming growth factor-b (TGF-b)/Smad3 induces Akt phosphorylation in vascular smooth muscle cells (SMCs). C: vascular SMCs were pretreated with the TGF- receptor inhibitor SB431542 (10 uM) for 30 min and then stimulated with TGF- (5 ng/ml) for 12 h, and p-Akt was measured by Western blot analysis. Am J Physiol Heart Circ Physiol 2012 302, H2211-H2219. SB431542 purchased from Selleck. Effect of small molecule inhibitors on reprogramming efficiency of myoblast cell derived from 5 different donors. (A) Reprogramming efficiency is shown as number of colonies from 10^5 starting cells on Y-axes. Ctrl, control condition and addition of small molecule inhibitors are marked. (B) AP staining of reprogrammed myoblast cell lines, from 5 different donors, in wells of 12-well plates at day 18. 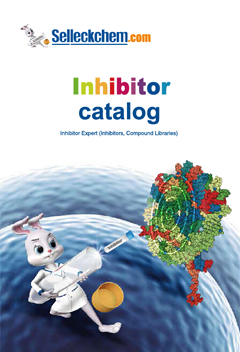 Ctrl, control condition and additions of small molecule inhibitors are marked. Stem Cells Dev 2013 SB431542 purchased from Selleck. Retroviral reprogramming of myoblasts. (C) Small molecule inhibitors effect on reprogramming efficiency compared to control. (D) AP staining of reprogrammed plates with or without inhibitors. Close-up of AP staining, bar 500 um; AP, alkaline phosphatase. TGFb1 mRNA expression in different follicles of the 26 weeks old hen ovaries and its effect on CTGF mRNA expression in granulosa cells. Effects of TGFb1 and inhibitor SB431542 on CTGF mRNA expression in granulosa cells from F2 to F4 and POF1 follicles. Gen Comp Endocr 2012 178, 314–322. SB431542 purchased from Selleck. Dr. Kah-Wai Lin of Karolinska Biomics Center. SB431542 purchased from Selleck. SB 431542 is dissolved in DMSO at a concentration of 10 mM. The kinase domain of TGFβRI, from amino acid 200 to the C-terminus, and the full-length Smad3 protein are expressed as N-terminal glutathion S-transferase (GST) fusion proteins in the baculovirus expression system. Proteins are purified with glutathion Sepharose beads 4B. Basic FlashPlates are coated with 0.1 M sterile filtered sodium bicarbonate, pH 7.6, containing 700 ng of GST-Smad3 per 100 μL. Assay buffer contains 50 mM HEPES (pH 7.4), 5 mM MgCl2, 1 mM CaCl2, 1 mM DTT, 100 mM GTP, 3 μM ATP plus 0.5 μCi/well ɤ33P-ATP, and 85 ng of GST-ALK5 with or without SB 431542. Plates are incubated at 30 °C for 3 hours. The assay buffer is removed by aspiration, and the plate is counted on a Packard TopCount 96-well scintillation plate reader. Method: To explore the effects of ligands, MG63 and NIH3T3 cells are seeded at a density of 8 × 104 cells/well in 6-well plates and starved (0.1% FCS for MG63 cells and 0.5% FCS for NIH3T3 cells) for 24 hours before ligand stimulation. Media containing various ligands are exchanged at 48-hours intervals. Cells are trypsinized and counted by a Coulter counter on days 2, 4, and 6 after ligand stimulation. To explore the effects of constitutively active receptors, cells are seeded at a density of 2 × 105 cells/well in 6-well plates. The next day, cells are infected with adenoviruses carrying various cDNAs at a multiplicity of infection of 100. Cells are trypsinized and counted on day 3. Cell proliferation assay is performed in the presence of 0.3 μM SB 431542. Animal Models: BALB/c mice receive intraperitoneal (i.p.) injections of colon-26 tumor cells. Callahan JF, et al. J Med Chem, 2002, 45(5), 999-1001. Inman GJ, et al. Mol Pharmacol, 2002, 62(1), 65-74. Laping NJ, et al. 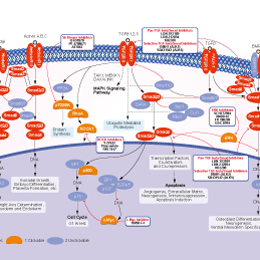 Mol Pharmacol, 2002, 62(1), 58-64. Matsuyama S, et al. Cancer Res, 2003, 63(22), 7791-7798. Halder SK, et al. Neoplasia, 2005, 7(5), 509-521. Tanaka H, et al. Oncol Rep, 2010, 24(6), 1637-1643. I would appreciate it if you can help me in figuring out the formulation for this drug in vivo experiments. S1067 SB431542 in 1% DMSO+30% polyethylene glycol+1% Tween 80 at 30 mg/ml is a suspension for oral gavage. It can also be dissolved in 2% DMSO+30% PEG 300+ddH2O at 5 mg/ml as a clear solution for IP injection.